One of our recent studies focused on measuring the lifetimes of Rydberg states of Positronium (Ps) [PRA. 93, 062513]. However, some of the limitations that prevented us from measuring lifetimes of states with higher principal quantum number (n), is the fact that such states can be easily ionised by the electric fields generated by the electrodes in our laser-excitation region (these electrodes are normally required to achieve an excitation electric field of nominally ~ 0 V/cm). We have recently implemented a simple scheme to overcome this complication, whereby we make use of a high-voltage switch to turn discharge the electrodes in the interaction region after the laser excitation has taken place. The figure shown above show the Background-subtracted spectra (the SSPALS detector trace is recorded with a background and resonant wavelength, they are then normalised and subtracted from each other) for n = 18 and n = 19. It is clear from the “Switch Off” that when the high voltage switched is not utilised (and the voltages to all electrodes are always on), that most of the annihilations happen at early times, especially around ~100ns, this is the time it takes for the atoms to travel out of the low-field region, and become field-ionised by the DC voltage on the electrodes. 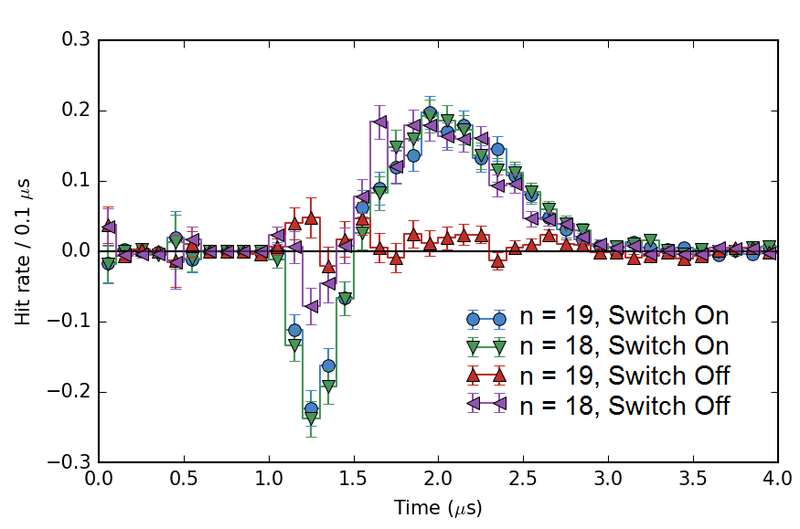 On the other hand, the “Switch On” curves show that both n = 18 and 19 have many more delayed events (after ~ 400 ns) due to Rydberg Ps being able to travel for much longer distances before annihilating when the switch is used to discharge the electrode biases. The figure above shows data taken by a detector set up for single-gamma-ray detection, approximately 12 cm away from the Ps production target, on the same experiment as described for the previous figure. 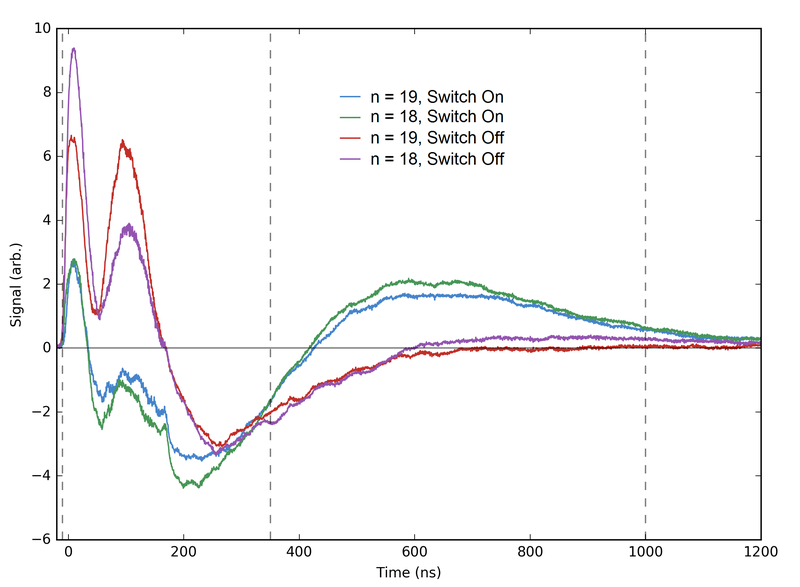 It is clear from this data that the time-of-flight (TOF) to this detector is ~2 However, in this case it is clear that only the n = 19 state benefited from having the “switch on”, indicating that is the smallest-n state that this scheme is necessary for our current electric-field configuration. These methods will eventually lead to more accurate measurement of the lifetimes of higher n-states of Ps, and the possibility of using those states with higher electric dipole moments for future atom-optics experiments, such as Ps electrostatic lenses and Stark decelerators.